Our client, a Lloyd's Managing Agency, is seeking a mid-level or senior student to join their team in London. The responsibilities of the role will be split between pricing and reserving. 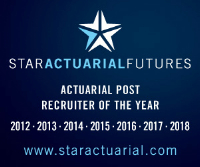 This is an excellent opportunity for an actuarial student to broaden their skill set in a mixed role. Candidates should have around 3 years experience in pricing and/or reserving, as well as strong technical and communication skills. London Market experience is advantageous.